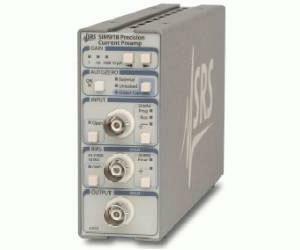 The SIM918 Current Preamplifier is ideal in applications in which the input offset voltage must be kept to a minimum. The DC voltage difference between the two inputs (current input and voltage bias) is accurately measured every 2 seconds, and is nulled. The result is a current amplifier with less than 10 µV input offset voltage. This autozeroing feature can be engaged or inhibited remotely or from the front panel, giving you flexibility in sensitive applications. As a current amplifier, the SIM918 offers input noise as low as 15 fA/√Hz and adjustable current gain (106 to 108 V/A). The output voltage range is ±10 V for all gain settings. Input bias current is less than 2 pA (DC), and the instrument has up to 22 kHz of (gain-dependent) bandwidth. There is a voltage bias input for setting the virtual ground potential to an external DC source. This input can range over ±5 V. The bias voltage can be internally grounded. An autozero sync input/output connection is also provided. In the internal autozeroing mode, this port provides a one pulse-per-second (pps) output synchronous with the internal switching circuitry. In the external mode, a 0.9 to 1.1 pps input signal generates the reference for synchronizing the circuitry. The SIM918 provides maximum flexibility for cabling and grounding. The shield of the current input BNC can be switched between chassis ground, the bias voltage, or the rear-panel Program input (which can be left floating, if desired). With the Program input, a user can supply an excitation potential to an experiment via the shield conductor of the input cable, while the excited current flows through the center conductor to the SIM918. The shield of the voltage bias BNC can be independently grounded or floated. The digital control circuitry in the SIM918 is designed with SRS''s special clock-stopping architecture in which the microcontroller is turned on only when settings are being changed (note that the autozeroing circuitry is independent of the microcontroller, and can operate while the digital clock is stopped). This guarantees that no digital noise can contaminate low-level analog signals. Settings may be changed from the front panel or through the remote interface. All instrument settings can also be queried via the remote interface. The module generates a status signal to alert the user of any overload conditions.